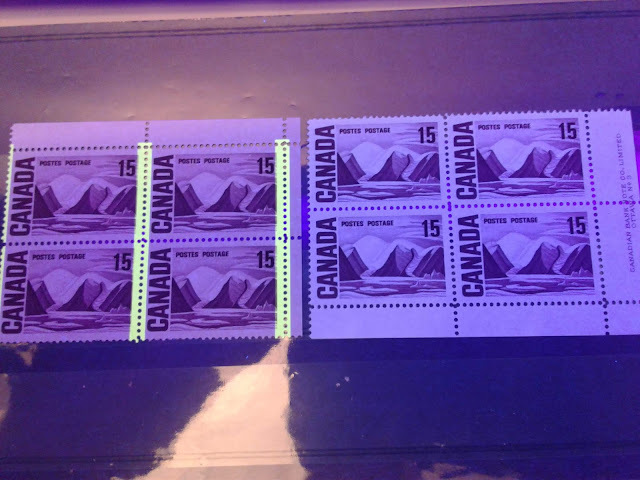 Shortly after I wrote the post about the Long Coronation Issue of Newfoundland, I began to discover perforation varieties that were not listed in Unitrade, as well as several compound line perforations. I began to wonder what more was lurking out there waiting to be discovered. As it turns out, I do have a few customers who specialize in Newfoundland and who are interested in the varieties of this issue. With that in mind, I decided to purchase as many of these sets as I could with a view to studying the perforations, shades and papers very carefully, just to see what I could find. I wound up purchasing some 40-45 complete sets from about 30 different vendors, most of whom were located in the US, but many of which were in Canada as well. To my mind this is getting very close to approximating a random sampling of stamps from the entire population, and consequently, by studying the stamps that came in carefully, it should be possible to draw very good conclusions about the overall population of Long Coronation stamps in terms of what the scarce papers, shades and perforations are. There are a number of very striking shade varieties that are so outstanding that it is difficult to see how the Scott, Gibbons and Unitrade catalogues could ignore them. Unitrade's assertion that there are three different perforations: line 13.7, line 14.1 and comb 13.3 x 13.2 is grossly incorrect. Those three perforations are actually line 13.8, line 14.25 and comb 13.4. In addition, I have identified some 17 more perforations, though most all of them are very scarce, comprising less than 10% of the total population. With this in mind, I have re-written the section of the post dealing with the perforations, outlining the varieties that I have found, explaining which are common and which are scarce, and I have attempted to offer an explanation as to why there are so many varieties. In addition, I have either replaced some of the scans showing the shade differences, with better scans, or I have added additional scans to show some of the most striking shade differences more clearly. Next week I will resume posts about the early commemorative issues of the current reign.